Small portions are expected in Japan, but this was a bit too small. Since the first item I tried on my April 2016 trip to Japan ended up being the rather mediocre Hokkaido Milk Pie, I felt that I would give the other "McSweets" promotional item a try since I wasn't going to review the oversized, but other than that, nothing special "Giga Big Mac" available at the time. 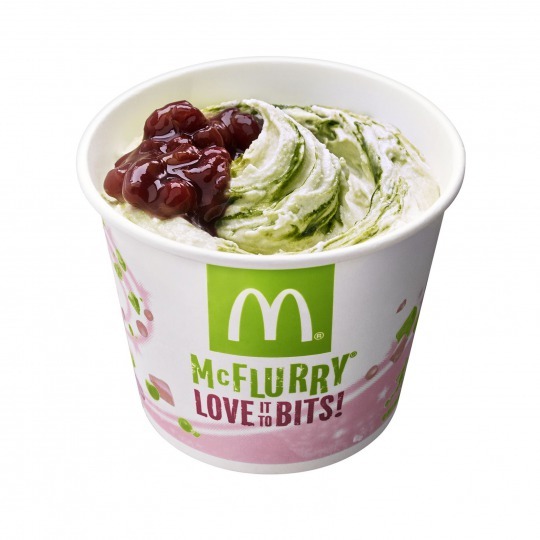 Since the Azuki Bean & Green Tea McFlurry wasn't something completely new to me, as I've had both a Red Bean Sundae before in Hong Kong (and also a Red Bean Pie) and a Green Tea McFlurry in Korea (and subsequently in Singapore when it was mixed with Oreo) I really only gave it a try since I had a coupon via the McDonald's Japan mobile application which made it a pretty reasonable dessert after a large Sushi dinner. I also thought that the quality might have been a bit better here since both the beans, and the tea were sourced in Japan. According to the pedometer on my phone, I had walked over 20km that afternoon, and other than having lunch and dinner, this would be the first time I'd have a snack. Thankfully I visited a different branch which was much quieter and calmer than the heaving branch I tried the Milk Pie at. The McFlurry was served quickly, and at first glance I was a little disappointed by the serving size. It was probably only a little more than 1/2 full, and the ice cream that was visible from the top of the cup, looked a bit lacking in the Green Tea department. Thankfully once I pulled the spoon out, I noticed that it had simply made it's way down to the bottom during the stirring process, with the beans only resting on top. The Green Tea exceeded my expectations and was stronger and of a noticeably higher quality than the Matcha I had in Singapore. But to be completely honest, since the Green Tea McFlurry I had in Korea was long before I started this blog, I can't remember clearly how strong that one was in comparison to this. The tea was "gunpowder" style, which meant it was extremely fine, and wasn't gritty at all. The tartness of the Grean Tea flavour would have been perfectly good on it's own, but when combined with the sweet, yet bitter Azuki beans, it was a perfect combination. The optimum bean : spoon ratio = 2:1. The Azuki Beans weren't just served on their own, but they were in a light syrup, which is created as standard part of their preparation, as they are boiled in sugared water. Normally, I don't like extra syrup on top of ice cream, but this was subtle and since it wasn't simply sugar added for the sake of it, I could eat it without guilt. As expected, the beans themselves still had a bit of crunch to them, especially in their centre, which I felt was a good thing, as soggy beans would have been great on ice cream. This led me to the only part I didn't like about this McFlurry was which when you had a few too many beans together in a single bite, it started to get on the dry side of pleasant, but not enough to knock it down from a perfect score.